Could a running machine be the answer to all my prayers? It’s the beginning of January and my husband and I are sat in our cramped office staring at our computer screens watching the minutes tick away and the bid prices go up on an Ebay auction. We’re buying a running machine. I am becoming more anxious and hysterical by the minute whereas Charles remains calm and appears to be jotting down some sort of cost-benefit analysis. ‘Saving on gym membership, risk of it breaking down, cost to repair, cost to replace, saving time going to gym and then there’s always tiring Alfie out.’ Suddenly I’m snapped out of my heightened state of anxiety. TIRE ALFIE OUT, the words echo round my head. I am no longer hysterical. I am suddenly laser focused on us winning this machine and basically spending as much money as we can afford on it. Seconds later we have won it. My husband and I have constantly struggled to work out the best way to handle our energetic, wild, sorry spirited, middle child. If I wasn’t a GP I would basically be at my doctors every week begging them for a diagnosis – ‘There must be something wrong with him.’ He never bloody stops. Of course when he’s at school he has the temperament of an Angel thus blowing the whole ADHD theory out of the water. I have often disagreed with his Daddy’s unconventional, and that’s being polite, parenting skills. Yes, some of them have worked but many of them could easily have resulted in a referral to social services. Buying a running machine in a bid to tire him out may just, though, have been an inspired decision. Of course when it arrives there’s great excitement at the new toy with everybody wanting to have the first turn. Mummy is making sure that the first turn, this time, has to go to Alfie because quite frankly this experiment can’t start soon enough. Over the next few days the excitement has worn off but it is still getting used. We’re all trying to work out the best way to get the most out of the monster that is now occupying a rather large area in our kitchen. I know we’ve got to be very careful as to how we conduct this experiment. One sniff that this isn’t about enjoyment and Alfie will never go on it again. And just with any good experiment we make mistakes and we learn from them. Dragging him mid tantrum on to a running machine for some interval training with Daddy was a near miss. So over the next few weeks it becomes apparent that the novelty still hasn’t worn off and he’s getting into a routine. As I walk through the door on Tuesdays and Thursdays my kids are normally engaging in some sort of exercise session. 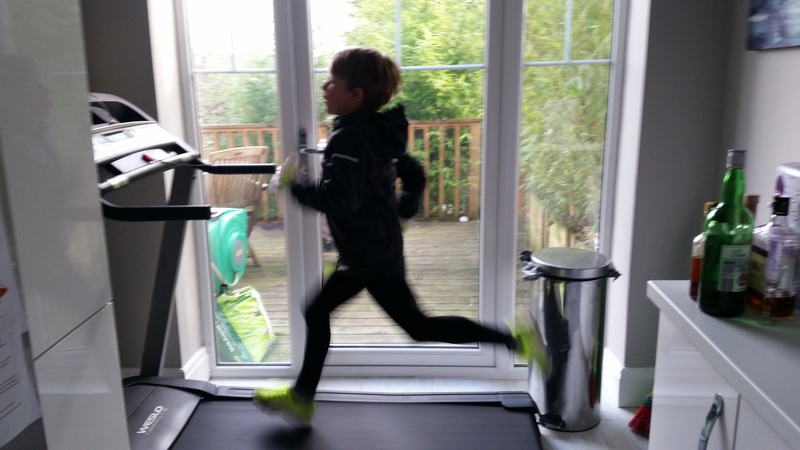 Abigail tends to be lifting dumbbells in the kitchen and Alfie is running at speed on the machine. Daddy will be stood beside him shouting words of encouragement next to him. I personally can not think of anything worse. Benjamin, the three year old, tends to be whirring round the table. I make a mental note to get him on this machine as soon as he’s big enough and before it’s not too late. There is absolutely no room for two Alfies in this household. I’m not holding my breath but this experiment seems to be working. Alfie goes on it of his own accord and the utter delight he gets when he goes up to 16 kph is priceless. When he’s winding himself up into a frenzy and I suggest 10 minutes on the running machine he knows that this is not a punishment. He is starting to understand that he will burn some energy and he always feels better afterwards. He has come to this conclusion himself. But you know what? This isn’t just about tiring my frenetic son out. There is a much bigger issue here. The issue is the fact that our children are simply not doing enough exercise. A recent study in The British Journal of Sports Medicine suggests that the decline in physical activity starts around the age of seven, Alfie’s age, and sitting is replacing physical activity from the time children start school. According to the national guidelines they should be getting at least an hour of exercise a day. Not only are kids getting lazier but they are getting fatter as 1 in 5 children is leaving primary school obese. I see this with my patients day in and out and it makes me sad to the core. We all have a responsibility to do something about it and the responsibility starts at home. It’s not, though, just about getting your children exercising but it’s also about leading by example. My kids are witness to an extreme version of this as my husband is a self-confessed exercise addict and an Ironman triathlete. But what about their Mummy? An avid runner and a swimmer as a child but by the time I was at university I was doing very little exercise. I had sporadic trips to the gym through my 20s and 30s and in a moment of madness I decided to run the London marathon in 2012. I battled injury throughout my training as I was, quite frankly, in no fit state to run up the stairs let alone run a marathon but I did it. Did this ignite a lifelong passion for exercise? Did it heck. The whole idea of running again filled me with dread and the excuses started to pour out. Some of them, like a broken ankle, were genuine but most of them quite frankly were down to sheer laziness. Insults that Alfie throws at me during one of his meltdowns tend to wash over me like water off a duck’s back. Not, though, when he shouts ‘WELL YOU DON’T DO ANY EXERCISE’. And he’s right. The trouble is now I have no excuse because the equipment is right there in my kitchen. So what have I done about it? Well I’ve started running on the damned machine three times a week at 7am in the morning. This is not some sort of whim and I know the novelty won’t wear off. Although I struggle to stick to so many things in life with any consistency my morning routine is set in stone. If a new activity is incorporated it will be stuck to religiously. So has Alfie noticed that Mummy is now exercising? Absolutely. His face lights up when he sees me on it in the morning and he shouts ‘Well done Mummy’. He asks how fast I’m going, secretly delighted that it’s nowhere near as fast as him. So we now have a running machine in our lives. We also have a little boy who may just have found the solution to burning some of that excess energy. I’m sure there are issues with bone growth, exhaustion, child cruelty etc. etc. Quite frankly, though, unless somebody has an alternative solution I’m not listening. It’s also a hell of a lot cheaper than boarding school! Katherine Hickman is a GP and a coach who lives in Leeds and is married with three young children. She works as a Salaried GP in Bradford. She is a passionate member of the Primary Care Respiratory Society and is currently working as an ambassador for the Public Health Collaboration. When she's not writing about herself in the third person she can be found running around after her three crazy children and waiting for her husband to come home after yet another bike ride to take over the childcare. By combining her coaching and scientific medical background she helps Medic Mums to focus on simple lifestyle changes and get clarity on what they really want out of life.